Since last year (August 2009), I’ve been writing quite a bit about Facebook Fan Pages and sharing tips, strategies, and “how to’s” on ways business can leverage their own Facebook Fan Page. The problem is that there is no easy way to view all of those “Facebook Fan Page tips” articles all in one place. 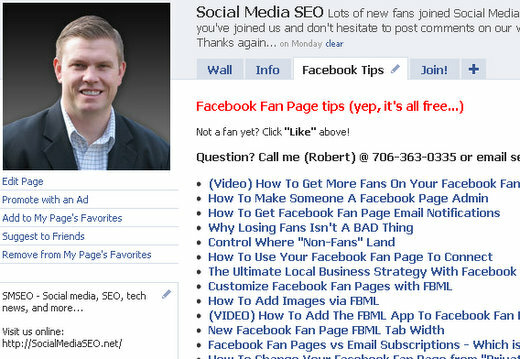 So I decided to make an addition to my SMSEO Facebook Fan Page by adding a “Facebook Tips” tab. I couldn’t add a “Facebook Fan Page Tips” tab because, quite simply, the tab would extend long enough to show all of those words – and of course, there is no going in and hacking the CSS code of the FBML app tab. If you are interested in learning more about Facebook Fan Pages, how to leverage them for your business, how to design custom fan pages, marketing, etc… then click the link below to see all of the Fan Page tips. I will add more as I write new articles. Let me know in the comments below if there is a specific “how to” you’d like to see – I’ll go ahead and write it up for you!